Bin and liners make it easy to collect and remove non-biodegradable kitchen waste without mess. Bags are easy to changent provide a tight fit with the bin lid. Good reordering and devilvery service from Simplehuman ensures we never run out of bags. Lovely rubbish bin bags but the top does not fit snugly round my bin. This is most noticeable when the bag gets full and heavy. Perfect fit liner , easy to take out of bin, tie handles & pull, love these liners. Am SO glad I bought that beautiful stainless trash can with the liner pocket! Such a brilliant idea to attach the bags to the can, nothing worse than trying to find a bag after the old bag is removed. Well, my husband LOVES this trashcan and the great bags--they fit perfectly, are VERY sturdy--he appreciates quality. After all, he married me, didn't he? The best waste management product on the market. You always get what you pay for and it is true in this case. Great waste bins but the bags are great too. Strong and reliable and very easy and clean to use. Great product. The first size code F liners I purchased from Amazon must have been the previous smaller size. Had a very hard time inserting the liner over the corners of my trash can. Repurchased the liners from Simple Human and the code F liners received were the new and slightly larger liners. What a difference! I used to hate having to change the trash liner but not any more! We received our first order of bags to fit our new trashcan and love both products. It would appear that the size F bags you sent me have been up sized considerably. They do not fit as well as the previous bags I have bought from John Lewis. Thank you for your review, simplehuman F custom fit liners have recently hanged in size and are now slightly larger measuring 555mm from seam to seam. I contacted you because the F bags I have used for years had become extremely hard to put on (add arthritis to that) Evidently F comes in two sizes. Your company kindly sent the larger size which I appreciated. Unfortunately that too is just as hard to put on. Guess I will try larger bag size next time. Clerk said that perhaps this was a push to make customers buy a new bin. *I hope not. I apologize if there was any confusion. We do not have 2 sizes of F liners, but we have recently increased the size of liners from 535mm to 555mm for a better fit. Our custom fit liners are designed for a snug, tailored fit so they stay neatly hidden beneath the lid — no messy bunching or slipping. Although I do like these liners, since they're strong and don't leak. However, from one batch to another, they fit the can differently, sometimes too loose, sometimes too tight. Otherwise, they'd be a 5-star product! Our F liners have increased in width size from 535mm to 555mm. You appear to have changed the sizing of your code F bin liners, they are bigger than previous ones and don't fit so well. I now have excess liner around the top edge which doesn't look good when I put the bin back in the outer container. Thank you for your feedback a customer reprehensive will contact you shortly. What can I say? They're terrific! Found these liners fit like a glove in our can. They are thick enough not to tear in normal use, but flexible enough to mold to the shape of the can. The draw strings are a plus and do not tend to tear-out as cheaper liners would. If you have a Simple Human can and don't yet use these liners, do yourself a favor and switch! Perfect fit been using for several years now Love em !! I have no problem ordering online directly from Simple human, but it would be convenient if they were available in local stores, but they are not. LOVE THESE BAGS....FORM FITTING --AND THEY SMELL GOOD TOO. Excellent quality and lasts for ages. Strong and easy to tie up. Excellent product for my Simplehuman kitchen bin. Now cannot seem to get the bags (F) from any shop in Brighton but online it has been very quick and will obtain again when needed. Very hardwearing compared to supermarket bags that are rubbish in comparison. Also they are the right size - wonderful! These liners are an exact fit and are strong enough to be always dependable. Strong, well constructed, with good draw strings, and do the job as required. Also easy to fit into the bin. Ordered on-line - easy to follow web site and very quick delivery service. Fit the Simple Human can perfectly with no overlap. fits the Simplehuman trash can which I empty several times a week. The quality is good and the liners don't tear upon removal. I really like my simple human trash can and bags. However, I recently had to by a new batch of bags and the quality is far less then when I originally bought them (2-3 years ago). The bags are much thinner and the over all quality seems less than. I haven't yet had any breakage and I understand the need to cut costs but....quality was definitely compromised for cost. Fits perfectly. Never had a complaint. Love the size, not too small or too large. Liners fit perfectly and are sturdy. Lid closes promptly, important as we have a dog that has her nose there right away. Easy to keep clean. It fills up the trash can. and the ties keep it closed and keep things from spilling out. I purchased the can at the local Bed, Bath& Beyond. At one point they discontinued carrying the replacement bags. My daughter went on line and found the place I could purchase the bags. I really like the closure drawstring making it simple to take out the garbage. What I like best is the ease of ordering. Not necessary to shop stores. Quality product. Been using the bags for years with absolutely no issues. Will continue to do so. A well fitting bag which comes at a reasonable cost and is well worth buying. I have found no bag to fit better for my under-sink bin. I now buy these and take them to France where we now live! The bags work as they should...sturdy, holds; nothing seems to tear thru. The problem is, is that the can is not sold in stores anymore and the only place this size is available is online. What happens when these are no longer available? We have enjoyed our Simple Human trash can for years! Because our can is no longer made or offered at our local outlet, we also can not buy the correct bags to fit the trash can. Being able to buy the trash bags online allows us to continue using a wonderful trash can and not simply replace it with a later updated model when ours still works perfectly well and looks great! I know it is only a bin but I think it is beautifully designed. It is easy to empty, easy to fill! and blends into my new kitchen perfectly. Right product, competitive price, prompt delivery. Are really pleased with the bags - tough and perfect fit. It looks fabulous, easy to use and clean. The bags fit perfectly. The size is just right. They fit our pedal bin perfectly, are easy to tie up when removed for the wheelie bin, extremely tough and good quality and well worth the extra cost rather than using any liners. I love the way the bin liners are made to fit each bin perfectly. They are good quality - but then you would hope they would considering the price you pay for them and the delivery charge as well. Finally something that, although pricey, is well worth ever penny. Our Simplehuman bin was brought us as a Wedding Presant and we love it. It is in daily use and the simplehuman liners that we buy fit so beautifully , easily and cleanly that we recommend the brand to one and all. we love the bin and liners. They make life easier. My life now has meaning! Wow! An opportunity to review trash can liners!! Well, thank you. Yes, these white plastic trash can liners are truly white and plastic. They aren't off white - they aren't paper, they are white and plastic. When garbage or trash is put in them it is amazing. Yes, these white plastic trashcan liners have transformed my life. They have cured many illnesses and cemented the most important relationships in my life. I have benefitted from a true spiritual awakening as a result. In a few weeks I assume that these white plastic trash can liners will amaze my friends and family. Thank you, thank you, thank you for this opportunity. I've tried cheaper non brand alternatives to this bin liner - but there is no doubt the simplehuman liner (although slightly more expensive) wins hands down on every count ie strength of liner and fastening. Easily to use with the simplehuman can. Easy to remove and tie and replace with a fresh one. The bags are great and fit perfectly but so do many others. The price is higher than other bags. Would I buy these again? Only if I could not find less expensive alternatives. Also, these are not the easiest to find. This liner fits the can it was made for perfectly. It is a breeze to install and to remove with the trash in it. Durable and strong. It never smells. Holds a bundle!!! Be sure to order the large quantity - then you know you are set for a while. I ordered at the same time I ordered the trash can. You will definitely get your money's worth with these products. They are truly the best! Great to purchase a most useful product in bulk. Bags a good fit for the size Simple Human trash can I purchased. Strong and manageable as well. This is a no brainer, no fuss trash can. It is a perfect size for my kitchen and the liners fit extremely well. The stainless steel looks nice and is easy to clean. The step pop up lid keeps my dogs out of the garbage! This can does a perfect job! I like the look and the size of my trash can. Its rectangular and the right size to fill up on a busy kitchen day. I like the trash to go out every night so its the perfect size. The 25 liter size bags fit it perfectly. If you buy a simple human waste basket you will never have the ugly plastic hanging onsides of basket. The liners are fitted on the insert and the excess stays in the can. The lid is really neat as it closes slowly so you can put something in and if you realize you have more trash you probably can put ir in before it closes.Durable,sleak and the best waste basket and liner system. Costlier than other bags. Sometimes the handles rip out. Fits perfectly - durable as well. Fit our simplehuman trash can to a tee. Price in bulk ended up about the same as generic drawstring bags. They hold up to stretching very well. I am very satisfied with this product and I intend to continue buying it. Though a little pricey, these liners are perfect, no-fuss inserts for the wonderful canister. (Not just a "waste-basket.") Sturdy, maximizes space, neat. Excellent liners, never break, always fit, easy to handle and to close. My mother was so taken with my bin, she actually bought one for herself and carried back in her suitcase to Portugal!! 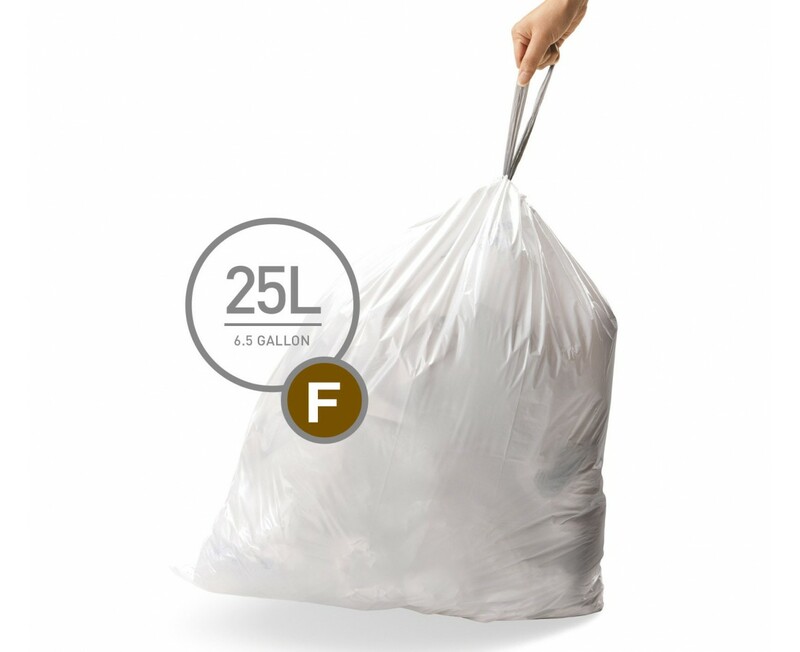 No more struggling with trash bags that are too small or too large! These liners fit perfectly and are easily removed for disposal. I love them. The liners work fine and they were easy to order over the internet. The bags are very handy--always fit, tie nicely, fit easily in a drawer,drop cleanly into the trash can, etc. Everything about them is really slick. However, there is no marking indicating their biodigradability. That's a problem. We recommend adding that info to the packaging. These liners are heavy-duty, neatly packed, and hold up to heavy weights and smells. Very good quality. excellent trash bags for dirty diapers! We use these bags/trash can for keeping dirty diapers. They work great...they are durable and we never smell a thing!